Product information "Bio Antistatic Hair Oil"
The higly pure BIO ANTISTATIC HAIR OIL is an intensive care for permed, dyed, brittle or chemically treated hair, that is statically charged. The formulation with cold-pressed seed oils from macadamia, jojoba and babassu contains a novel 100% herbal repair complex. This repair complex smoothes the roughened surface of damaged hair fiber, acts antistatically and provides natural hair shine and vibrancy. Especially in winter and wool hat time our hair is exposed to additional stress by dry heating air in combination with cold weather: The hair is flying and lacking shine. 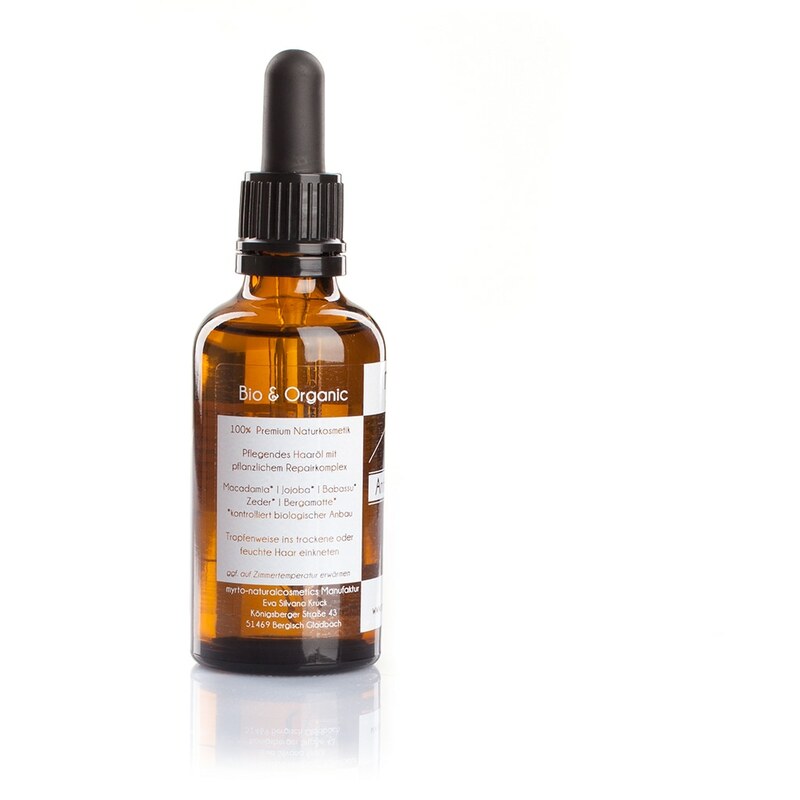 The organic ANTISTATIC HAIR OIL provides rich nutrients for deep regeneration of damaged hair and split ends. 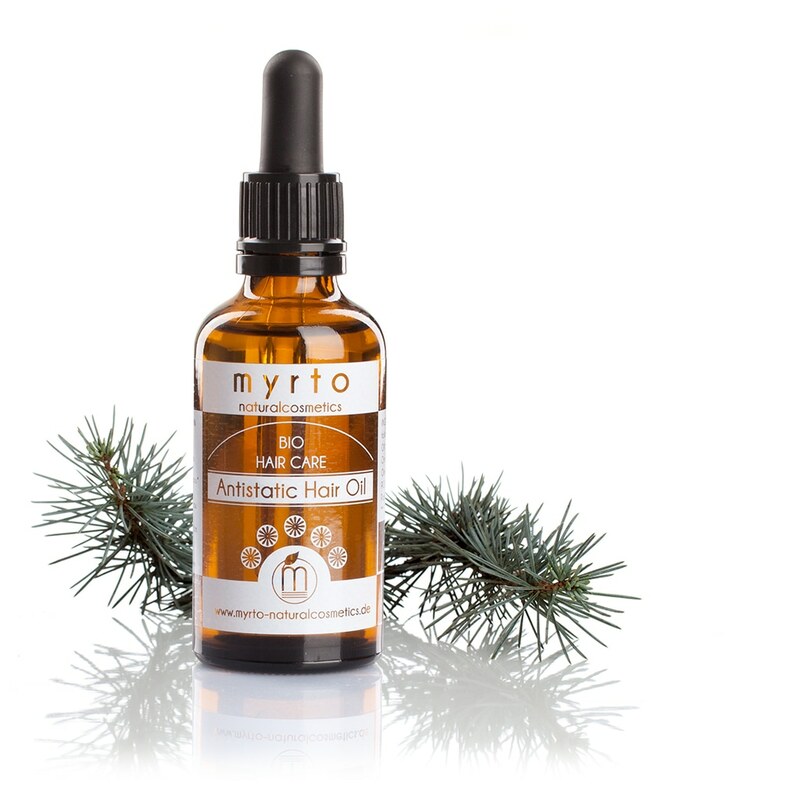 Antisatic Hair Oil contains a powerful combination of selected cold-pressed plant oils from organic cultivation, additionally an anti-static repair complex of pure plant origin. With regular use, hair texture and elasticity will improve, natural shiny hair will reappear. Repair-complex of pure plant origin - antistatic, improves vibrancy and wet combing, smoothing the rough surface of damaged hair fiber. No preservatives, no alcohol, no silicones, no petroleum derivatives, no synthetic coloring or artificial fragrances are added. The product is without genetic modification or nanoparticles. The product is vegan. The Antistatic Hair Oil can be applied in several ways: 1. As a regenerating rinse-off treatment: Before shampooing 30 minutes or longer, even overnight leave in for more regeneration. Mainly apply on dry, porous hair ends and damaged strand hair, spare out hairline. Thoroughly rinse off with a mild organic shampoo. 2. As leave-in treatment for healthy and shiny hair tips: Take about 3-5 drops, rub between your hands, knead in hair tips thoroughly. 3. 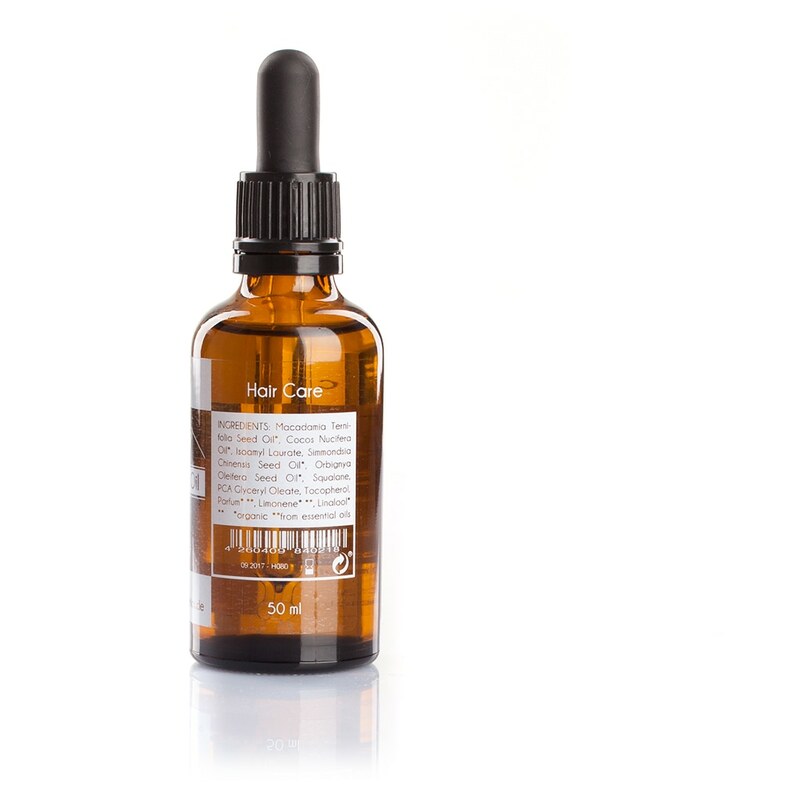 As rinse-off scalp treatment: Apply sparingly dropwise with a pipette directly to the scalp and massage gently. Leave on 30 minutes or longer. Then thoroughly rinse off with mild organic shampoo. Our organic hair oils are pure and without liquefying additives. Consequently at cooler temperatures they become more viscous and tend to settle. In this case briefly put the glass bottle in a mug with heated water. Thus the oil will re-liquefy quickly. With our natural oils we do without the addition of liquid creators. Therefore, it can happen at cooler temperatures that the oil is viscous and can also settle. In this case it is sufficient to put the glass bottle briefly in a beaker of heated water. Thus, the oil liquefies quickly. The natural essential oils contain as natural component Limonene und Linalool. There are no isolated fragrances added. An explanation of the ingredients can be found in our list of ingredients. The plants we use for our products are described in our active agent glossarary. Customer evaluation for "Bio Antistatic Hair Oil"